It’s seven minutes to 5pm on a Sunday afternoon in Elephant and Castle, South London. A street preacher is delivering a blessing to a Colombian musician who plays U2 songs outside the shopping centre. The man closes his eyes and rests his head back against the wall as the preacher lays his hand on his head and recites prayers in Spanish. The markets outside the shops have packed it in for the day; people rush to get into Tesco’s before it closes at 5. Here there are no gaps for horizon. Elephant and Castle, spread around the massive Newington Causeway round-a-bout is completely walled in by buildings. It’s grimey, noisy and the pedestrian tunnels that connect everything smell of urine ripened in the sun. Rising above this whole scene is the mammoth Heygate Council Estate. Once home to more than 3000 people for over three decades it is now almost empty. Its boarded up windows stare out like dormant, vacant eyes. 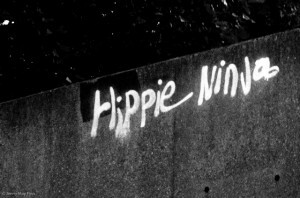 It’s become a hotspot for graffiti artists, vagrants, squatters and community gardeners. But words do not describe its vastness or how much it symbolises decades of social and urban deprivation in the area. Conceptualised as a public housing paradise, an answer to the damage done to the local area by German bombers in World War 2, over time its reputation soured dramatically. But for some of those first families who moved into Heygate over four decades ago it was the first time they’d ever had access to indoor toliets and central heating. 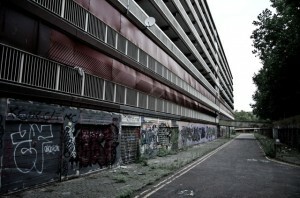 For many residents, living at Heygate in those early days came with a sense of pride. Fast-forward 20 years and the Estate had changed dramatically. Crime levels rose and Heygate furnished a reputation as a very dangerous place to be. The huge walkways that connected the buildings to each other had become places where people on the run from the police would disappear. The dream of urban utopia had drifted apart. The estate itself spans from Walworth Road to New Kent Road, officially in Walworth but bordering Elephant and Castle. In Zone 1, it is a short trip from central London. Its closeness makes it prime real estate to developers. 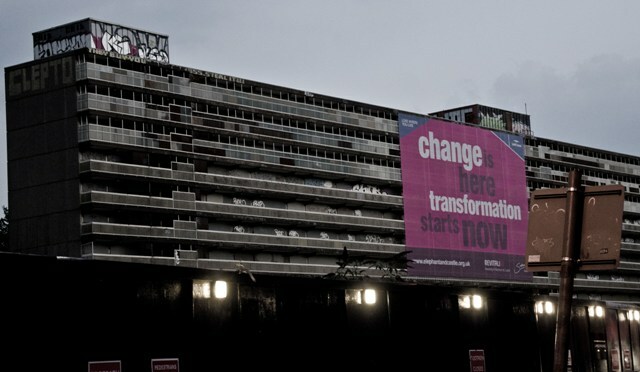 In 2008, the local council decided to tear Heygate down rather than restore it. Thousands of residents were ordered out. Those who by now owned the flats they lived in were handed Compulsory Purchase Orders and told to vacate. Some left; some resisted for as long as they can, and the council promised residents the option of returning to new flats once they’d been built. In all, the council spent £44 million evacuating the estate, which was just shy of the £50 million pounds developers paid for it. And despite those assurances of new flats in the area, many former Heygate residents, no longer able to afford homes in the city, have been catapulted to the furthest outreaches of London, miles away from friends, family and a community they’d largely cherished. The loss of a sense of community has been mourned by residents like Angela Amporah, who moved out of the estate in 2008. 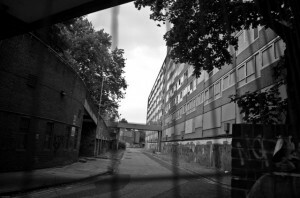 Her story is part of a project put together by an activist group to highlight the impact of the ‘regeneration’ project that closed Heygate Estate. The discovery of asbestos behind the concrete walls of Heygate has delayed its demolishing until 2015. So now mostly vacant, it’s a popular place to ramble around. To get into Heygate you have to follow its high outer fences that face onto the main road, past the revivalist ‘Crossways’ church and into wide street of factories and mattress wholesalers. Most of the walkways that lead up to the houses have been blocked off by huge sheets of metal, and stairway railings have been coated with anti-climb paint. But it’s not impossible to make your way onto roof – even through empty flats strewn with all sorts of debris. It’s also not hard to gain access to the urban jungle beneath the high-rises, the grounds of the estate. All that guards the entrance is a low brick fence and sometimes a guard who sits on a plastic chair, talking on his mobile phone. In the back of a station wagon he has a German Shepard in a cage. He barely looks at us as we walk in. Down on the ground at Heygate there is a lot of rubbish. An abundance of plastic bags. Empty chocolate bar wrappers. Broken glass. All the hallmarks of an abandoned urban space. It’s an eerie place for the most part. Voices don’t echo off the walls; they are more absorbed into their surroundings. A few skaters sip beer from cans on an old basketball court; people walk around taking photographs and swinging around on an old whizzy-dizzy that’s been left to rust. There are greater signs of life: locals – deprived of space – have divided up patches of ground for gardening. And in one corner of the estate there are signs of people still living here. People gather for lunch over table and chairs in an outside area between two buildings. In one of the ground-level flats there even looks to be electricity. Next to where they eat is a sign that reads Heygate was home. The council says that in less than two years time, Heygate will be gone. 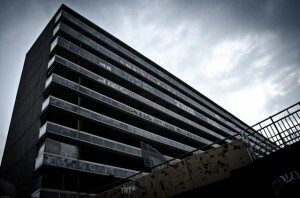 Despite its bad reputation, it has served the community in two ways: first, as a home for thousands of people; and second, as an abandoned landmark; a place residents could reclaim as their own. The council not only has plans for Heygate and the nearby Ayelsbury Estate, but the whole area. It’s all part of an over £1 billion “regeneration” plan. the area is being prepped for wealthy foreign investors. That in 10 years time there will be no Colombian U2 singers, no housing estates, no late afternoon shoppers left for the street preacher to preach to; that the area will be as soulless as the tower blocks that encroach upon it. This entry was posted in Featured, World and tagged london, world. Bookmark the permalink.